At the end of the Middle Ages, art across Europe was dominated by a decorative and refined manner known as the International Style. Ornate, with brilliant color and gilding, it reflected courtly tastes and continued, for some time, to attract patrons in Milan, Ferrara, and other aristocratic Italian cities, even as more naturalistic Renaissance styles began to take root elsewhere. By the mid-1400s, in Florence especially, both artists and patrons had begun to embrace new subjects and approaches. Earlier, the city’s ruling Medici family had eagerly sought serene Madonnas and other religious pictures by Fra Angelico and Fra Filippo Lippi among others. 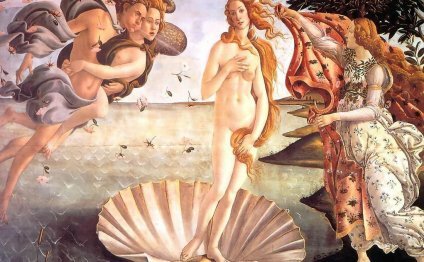 Now the younger artists they patronized, Botticelli in particular, were increasingly influenced by new humanist ideals. The humanists’ rediscovery of the literature, thought, and art of ancient Greece and Rome focused new attention on the individual and placed greater value on a person-centered view of the world. Linear perspective, devised and codified by Florentines Brunelleschi and Alberti, constructed space from the vantage point of the viewer to produce convincing representations of depth. Landscapes increasingly reflected nature as experienced in the real world, with a feeling for space and atmosphere. Leonardo, through careful observation of man and nature, made innovations that astounded his contemporaries. Venetian painters, beginning with Bellini and Giorgione, adopted a uniquely intuitive, even poetic approach to nature. The human figure also attracted new attention. For the first time since antiquity, artists painted and sculpted large-scale nudes; some, including Castagno, at times adopted poses taken from classical statues. And in portraiture, too, changes occurred, as individuals had their likenesses recorded in three-quarter views that were revealing of character and personality.